This entry was posted in 2012, Armando Morales, California, debriefing, Dr. Edgar Schein, gang validation, learned helplessness, NCTT-Cor-SHU. Corcoran-SHU, solitary confinement, suicide, torture, United Convention Against Torture and tagged 2012, Armando Morales, California, debriefing, Dr. Edgar Schein, gang validation, learned helplessness, NCTT-Cor-SHU. 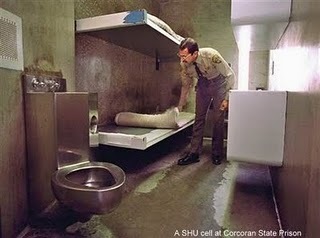 Corcoran-SHU, solitary confinement, suicide, torture, United Convention Against Torture. Bookmark the permalink.